Both Scrapbook 106 and 107 need additional donations! o/ 9 for each! Hopefully we can complete the scrapbooks on time! ✔ Scrapbook Overtime operates on first come first serve fashion. ✔ All donations must be done in this post! Donations made somewhere else won't be considered. ✔ This means anyone can donate to them provided they haven't donated to these respective Scrapbooks before. This won't have any effect on your donations to other Scrapbooks this round. 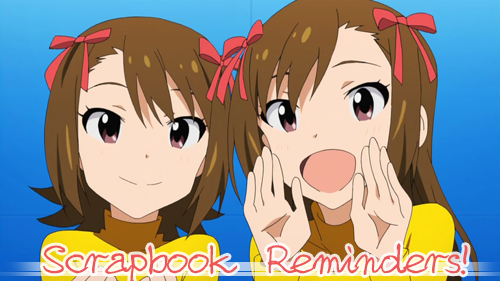 ✔ The usual classic Scrapbook rules apply - you may only donate one character and the deck can have one character per series. ✔ Your image must be in color and fit our vertical template. If it does not fit well or is not high quality enough, I will ask you for another pic. If we already have a deck of the character, please use an image we haven't used in the character's deck. If I notice you using an image we already have a card of, I will mostly likely ask you for a different image. (You will not lose your spot). Help me out and check to see if your image has already been used in that character's deck! ✔ For donating you'll receive 3 random cards and 1 random candy. ✔ This Scrapbook will remain open until all spots are filled! Also, you can still donate to the Lottery themes here. Please don't be discouraged from trying even if you're donating to this scrapbook! You'll still get prizes even if you're not picked! If you didn't make it on time to donate to cards 01-10 of these Scrapbooks, donations to second halves of the decks will open in 12 hours, at Midnight, November 1st, GMT-10 (6 am EST). Check here to convert this to your timezone! There will be a separate post for this! This round will go up on October 31st and once more on November 1st (GMT-10). Donating to cards 01-10 will open at 12pm GMT-10 (6pm EST)and cards 11-20 will open at Midnight, GMT-10 (4 am EST). Our Scrapbooks aren't quite filled yet, and so that means overtime! ✔ For donating you'll receive 3 random cards and when the deck is released, you'll be able to pick the card you donated. Also, you can still donate to the lottery themes of Seinen and Josei! Please don't be discouraged from trying even if you're donating to this scrapbook! You'll still get prizes even if you're not picked! If you didn't make it on time to donate to cards 01-10 of these Scrapbooks, donations to second halves of the decks will open in 12 hours, at 10pm, GMT-10 (4 am EST). Check here to convert this to your timezone! There will be a separate post for this! I'll be out today so I won't have the time to close off the post so be sure to keep track of how many players donate because I will cut off any donations past the 10th donation when I come back! Sorry for the inconvenience. This round will go up tomorrow, May 23. Donating to cards 01-10 will open at 10am GMT-10 (4pm EST)and cards 11-20 will open at 10pm, GMT-10 (4 am EST). - I will be lifting the limits for Scrapbook 56 and Scrapbook 57 so if you have donated to either before, you're free to donate to either scrapbooks again! I hope either gets done in time for the upcoming release or next one so go donate a second image! It will close when all slots have been filled. Scrapbook 56 went up before this one! Be sure to check out both of them when you can! Whoa this is about a year since I've posted..hopefully this deck will be done in time for March! 6 days until Christmas, guys! Has anyone finished their shopping or given gifts yet? Today's Topic is: Christmas Specials! As with the holidays and retails going out with big discounted deals during the month, there are also happenings in which shows have their own "christmas special" or "christmas episode". My question to you is, what is your favorite christmas-related special/episode that you enjoyed? Since this is a broad topic, do feel free to list ones that may not be of eastern origins! You may claim 1 special card and 1 character card if you answer it! Ever wondered what your favorite character from one series would be like in another universe? Would they have special powers? Would they be any different than in their own universe? If you had the authority, would you take them from one universe to another? Perhaps you'd like to see happenings between interactions of multiple characters. Are there any two characters you like for them to meet? What relationships would they have? what kind of things would they be doing? How would others around them react? Do give your thoughts and opinions of a crossover you'd enjoy and you get 2 character choice cards, one starting with the letter c and one starting o as well as 3 random cards? If you give me a detailed description of this crossover, you get another 2 random cards C: Let's see what you guys come up with! If you can tell Shikamaru the full name and the series they come from and you'll be rewarded 2 cards. Click here to visit the art gallery! Here's the previous round's roundup! Lmfao not much but kajsdna I think a lot of us have been busy!! But do turn in art when you can, guys! October/November Open Fic and Art Submission!! For each character's designs, please visit the website. This will close on November 30th February 28th, 2013! Hello guys! This is Chuu and I'm here to announce that game 9 (as well as other games) will be ending on August 22nd so if you have not participated yet, I suggest you do it as soon as you can. There will also be an adjustment in which should benefit those who are behind in Shirocchi's game. If you have participated and gotten your point in that game and would like to help out, please read the extra rule here on how you can lend a hand to those wanting to finish their rounds. It would be appreciated if you could help a little, because a little does go a long way! August/September Open Fic and Art Submission!! This will close on September 31st! 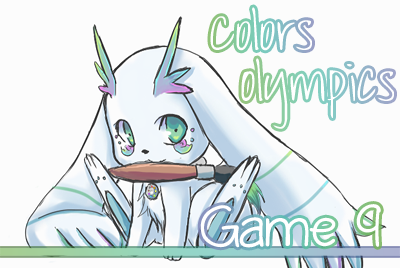 Welcome to game 9 of the Colors Olympics! Shirocchi thought it would be nice to have an intermission between games so he decided to flip through the colors' household coloring book to color something. 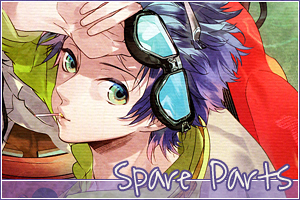 Hello everyone and welcome to another round Spare Parts! Tsubasa and I are here to examine some gadgets, robots, and the like and we need your help to figure out more about them!